Fresh air. Beautiful views. Sounds of nature. Ahh, the great outdoors. And I'm not talking about the movie (although it is a funny one). I'm talking about the real thing. Outdoors. 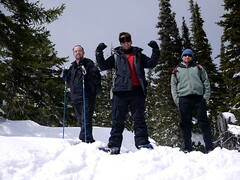 This Saturday I got to go out into nature and enjoy my first time snow shoeing. Josh and I were lead by two friends Aaron and Casey. We had a great time plowing around in the snow. 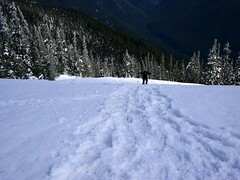 We opted on going a little further out of the way to get to some awesome snow and great views at Olympic National Park. Not the tropic rainforest part you all might be familiar with- this is a big park - not just banana slugs! 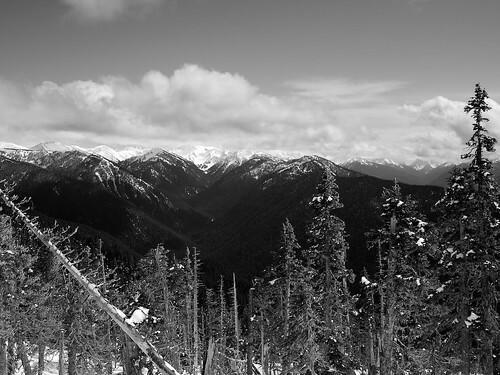 We were in the mountains, the Olympic Mountain range at Hurricane Ridge (check out the web cam). Our outdoor adventure began at 7:20am when were off on the road to catch the 7:55am ferry. We took the Bainbridge Island Ferry to go up and over to Olympic National Park - it seems weird, but everyone assured me this was faster. Here's our path Seattle to Mountains (I told you it was a big park - see all that green, that's the National Park). At the wee hours of the morning, we caught some nice views looking back at Seattle as we sailed off on the ferry (is sailed the right word? hmm). Once back on land, we drove onward for 2-1/2 hours. Our only stop was Safeway to stock up on lunch sandwiches and water. Then off to the Visitor Center to get some trail info. After driving through vampire-like fog (yes, very Twilight of me), we got to the top of the mountain. 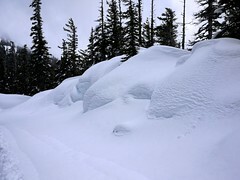 Then we just pulled off to the side of the road, parked, and climbed up the snowbank. We strapped on our shoes and headed off. Now, to me, this did not seem like a trail. No parking, no trail head, no trail map. This is true outdoor adventures. On the top of the snow (I say this because on the road, the snow level was above our heads), we saw a small blue pole barely popping out. This was our trail indicator! Where did the trail start? All we saw was down, down, down. Could one really walk down that hill? In ordinary dry weather that hill was way too steep, but snow makes everything magic. Our magical snow shoes took up down that steep hill. Although Josh's shoes weren't so magical at one point. No matter though; we all made it down the hill to flatter ground. Ah ha! 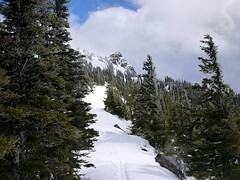 The ridge with the trail. Although there wasn't really a trail, it was just a ridge that could become a trail. We stomped along in our special shoes to wondrous sites. Sometimes we were surrounded by fog and others delightful sunshine. Aren't we quite the trail blazers? 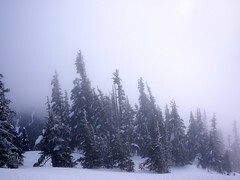 Look at this lush snow! We have conquered. Shortly after lunch, I took a video. 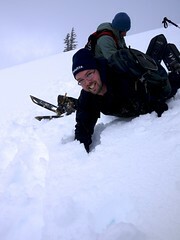 Yes, it's wobbly, but seriously I'm on the side of a mountain and turning in snow shoes is NOT easy. Balance is difficult with an iPhone. Our lunch spot was prefect. Of all the trail, we saw only one place without snow. And it just happened to be 1pm. It must have been a camp site the night before because there was even firewood to make wood chairs. How perfect. Left Home @ 7:15am. Retuned Home @ 8pm. Left the car @ 11:15am. Retuned @ 4pm. That's a 4.75 hour hike. I took a bit of a nap on the car ride home. Isn't that a nice feeling; to have a nap after fresh air and exercise. I'm tired, but if you want to see more, go to my Flickr photo album. Thanks to REI to helping make this trip possible.